Since electronic cigarettes hit the market in 2003 they have been touted by many as a ‘healthier’ options for smokers who are eager to leave the real deal behind. However, there has been little research on the rising trend – leaving some questioning the potential health risks of vaping. 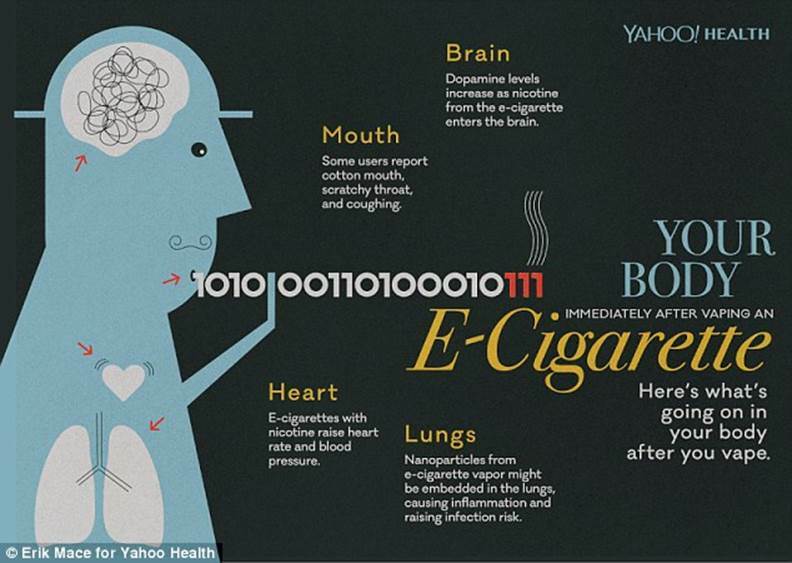 And now, a new infographic created by Yahoo Health reveals what is known so far about what happens to a person’s body immediately after vaping an e-cigarette, exploring how a few puffs may affect your mouth brain, and lungs – and it’s certainly not all as ‘healthy’ as you might think. In fact, as the infographic explains, smoking an e-cigarette can often lead to the same feeling of ‘cotton mouth’ that most smokers experience after inhaling traditional cigarettes, as well as a scratchy throat and a cough. And then there’s the risk e-cigarettes pose to your lungs; while the dangers might not be quite so apparent as they are when it comes to actual cigarettes, vaping can still cause some serious damage to these organs. According to the infographic, ‘nanoparticles from e-cigarette vapor’ can become embedded in the lungs, causing inflammation and increasing the risk of further infection. Much like the traditional option, e-cigarettes also release a feeling of pleasure as dopamine levels rise and enter the brain – but those with nicotine can also raise heart rate and blood pressure. E-cigarettes are considered to be a healthier option for smokers because they simulate the feeling of smoking without any smoke or burning, and a new study by a UK health agency deduced that vaporizers are 95 per cent less harmful than traditional cigarettes, suggesting that they can even help people quit tobacco. ‘They’re simpler than cigarettes,’ Jonathan Foulds, a professor of public health sciences and psychiatry at Penn State University’s College of Medicine and Cancer Institute told Yahoo Health. ‘You burn it, cigarettes creates 7,000 different chemicals into your body,’ he explained. ‘But with e-cigarettes, there’s no combustion. The good news is that you’re inhaling a vapor that’s got four to five things as opposed to 7,000 things. The small amount of research shows that electronic cigarettes may affect the user’s mouth, lungs, heart and brain. Although it is unclear why, some users complain that after vaping they experience dry mouth, coughing and throat irritation. As for what users are inhaling, vaping may cause inflammation on the user’s lungs. According to a study published in the journal PLOS this year, the inhalation of e-cigarette vapors damage the epithelial cells in the lungs, which leave them at risk for infection. The study’s author, Qun Wu, told Yahoo Health earlier this year that e-cigarette liquids, whether they have nicotine or not, ‘inhibit lungs’ innate immunity’, which helps it defend itself against infections. The US Food and Drug Administration warns that e-cigarettes have not been properly studied, so it is unclear to how much nicotine or other potentially harmful chemicals are being inhaled through vaping. Although the agency has issued a proposed rule that would extend its tobacco authority to include e-cigarettes, they are not currently regulated by the FDA. The contents of the liquid solution found in vaporizers vary by brand and flavors, and nicotine isn’t necessarily a component of all e-cigarettes. Some versions of the produce even allow users to adjust the liquid solution to their liking. There are hardly any studies on the effects of e-cigarettes on the body, and American Lung Association argues that early studies show that e-cigarettes contain nicotine and other harmful chemicals, including carcinogens. Like traditional cigarettes, vaporizers that contain nicotine raise the user’s heart rate and blood pressure as an adrenaline rush overcomes the body, however, a European study found ‘none of the heart problems associated with tobacco cigarettes among e-cigarette’ users. Vaping may also be addictive. E-cigarettes give users a feeling of pleasure as dopamine levels rise in the brain. While nicotine is not a carcinogen, it is still addictive, and many agencies fear that e-cigarettes may actually increase the odds that vapers become addicted to other substances. The American Lung Association voices concern that the claims that e-cigarettes help people quit smoking are unproven, and that they may actually serve as a gateway for the use of traditional tobacco products – particularly for teens. According to new data released by the Centers for Disease Control and Prevention electronic cigarette use among teens has surpassed traditional cigarette use for the first time. However, one thing is for sure, pregnant women should stay away from e-cigarettes, The nicotine found in vaporizers puts unborn babies at risk for preterm birth, low birth weight, higher still birth rates. The American Lung Association stated that without FDA regulation, ‘there is no way for the public health and medical community or consumers to know what chemicals are contained in e-cigarettes or what the short and long-term health implications might be’. The majority of U.S. e-cig vendors make unsupported claims on their Websites, a watchdog group has charged after surveying the online presence of 159 companies. That e-cigarettes have health benefits. That they can help with smoking cessation. That they can be legally used nearly everywhere. That they are cheaper than tobacco smoking. Two thirds of the suppliers made at least one of these assertions, it found. Most frequently seen were health-benefit claims, made by around half the companies. More than 40% suggested that e-cigs are cheaper than tobacco cigarettes; nearly a third referred to e-cigs’ usefulness in giving up smoking, while a similar number said their products could be used virtually anywhere. TINA also noted examples of companies selling e-liquid in what it calls “kid friendly flavors”, and found that around 40% offered such products. “Online e-cigarette companies are taking advantage of the regulatory gap to market their wares with a variety of suspect claims. Some are blatant while others are subtle, craftily-drafted veiled claims,” TINA said. Only three companies of the 159 fell foul of TINA’s criteria in all four categories and also sold flavoured e-liquid with supposedly child-friendly flavours: they were LeCig, Mt. Baker Vapor, and VapingZone. Last year a notification from TINA was among the prompts that led Utah’s division of consumer protection to crack down on e-cig companies that had “advertised false health claims, posted false customer testimonials, marketed ‘free’ trial offers that were not in fact free of charge, and…charged customer accounts without consent”. h the issue of truth in advertising, regardless of whom they may or may not appeal to. However, we shouldn’t write off the research because of that. It’s undoubtedly the case that, while the industry as a whole is responsible, there are a lot of dubious claims being made for e-cigs online. This likely out of ignorance or enthusiasm in most cases, rather than with any intention to deceive; but that won’t be a much of an excuse in the eyes of regulators. Bringing this issue to the forefront with some startling numbers is therefore welcome. The American Lung Association said without FDA regulation there is no way to know the short and long-term health regulations might be. New Delhi: In January, the government asked for public opinion on tougher new laws to curb smoking: To raise the minimum smoking age to 21 from 18, and to ban the sale of single cigarettes, which account for 70 percent of nationwide cigarette sales. People responded enthusiastically; 45,000 emails and 100,000 letters poured in to the health ministry, as Reuters reported earlier this month. What they said, however, is not known because the government hasn’t yet read the messages, according to a health ministry representative quoted in the story. Like those messages, the World Health Organization’s Report on the Global Tobacco Epidemic 2015 is largely ignored in India. Its single-line message: Raising tobacco taxes can help curb smoking. * About one million Indians die from smoking-related causes every year, which are among the top three ways to die. * Smoking also saps Indians of money; more money, it emerges, than it earns for the government. Indians aged 35 to 69 spent Rs.104,500 crore ($15.9 billion) in 2011 on diseases associated with tobacco-including cancer, respiratory diseases, tuberculosis and cardiovascular diseases. This figure is almost six times as much as central excise tax collections from all tobacco products that year, according to the Indian government, WHO and the Public Health Foundation of India. To put the health cost of tobacco in further perspective, it exceeded the combined annual state and central government expenditure on health care by 12 percent in 2011. Taxes on cigarettes rise – not enough – but they do. Bidis are the problem. A 10 percent price increase on tobacco products could cut consumption between 2-8 percent in developing nations, according to the WHO. Tax hikes increase prices, which in turn lower demand and protect people from the ill-effects of tobacco. Over the last 19 years, taxes on cigarettes in India have risen 1,606 percent. That isn’t quite enough and the six-tier tax structure is so complex – based on stick lengths and filters – that companies manipulate it with relative ease to keep demand intact. The biggest problem in curbing tobacco use lies with the influence wielded by those who make the humbler – but more damaging – cousin of cigarettes, the bidi. Taxes on a pack of bidis are 7 percent of the retail price, less than a tenth of the WHO’s suggested level of 75 percent. A 20-stick pack of best-selling cigarettes is taxed around 60 percent of the retail price. Bidi smokers make up 61 percent of the nation’s 120 million smokers, according to the Global Adult Tobacco Survey 2010. This is a conservative estimate. Some studies peg the numbers of bidi smokers higher, at 73 percent and even 85 percent. Bidi smokers face a higher risk of developing potentially-fatal chronic obstructive pulmonary disease, among other illnesses, because tobacco is packed more loosely in bidis, requiring smokers to inhale more strongly. But the bidi industry has consistently squeezed concessions from the government. Millions of jobs and livelihoods at stake, so taxes must stay low, argue bidi barons. Handmade bidi units (98 percent of bidis are handmade) producing less than two million sticks in a year are exempt from excise duty. Bigger bidi makers pay a duty of 1.6 paise per handmade stick and 2.8 paise per machine-made bidi. The duty on cigarettes varies between Rs.1.28 and Rs.3.37 per stick. Some eight million people work as bidi rollers nationwide, said a representative of the All India Bidi Industry Federation. Increasing taxes on bidis would invariably increase the illicit trade in bidis, leading to the proliferation of fake bidis, Sable argued. It would also deprive states and the central government of tax revenue. These arguments do not wash, say experts. In 2013, the bidi industry contributed less than three percent to the government’s central excise collection from tobacco products, not surprising, given the low excise duty it pays. A Public Health Foundation of India study says there is indeed scope for taxes on bidis to be increased. “Doubling bidi excise would help cut consumption by 40% and increase tax revenue by 22%,” said Monika Arora, director, Health Promotion and Tobacco Control Initiatives, Public Health Foundation of India. Essentially, the argument goes, higher tax rates would offset any loss of excise from fall in consumption. In the bargain, spending on “useful” goods and services will grow. Additional revenue could help the government meet the cost of transitioning bidi workers to other means of employment. The government has previously considered a cess on cigarettes to encourage farmers to switch from tobacco to other crops. So, why not tax all segments of the tobacco-products industry, experts suggest, to fund a gradual transition? Bidi workers, among some of IndiaÂ’s most disadvantaged people, can only benefit. Fla. (CNN) – Smoke-free devices like e-cigarettes have become a popular way to break the nicotine addiction. Vapor pens, for example, allow smokers to control the amount of nicotine they receive. On any given afternoon, Broward County deputies come across drugs this. This is flakka – just one of the inexpensive synthetic drugs ravaging south Florida — and there’s a new twist that’s making fighting these drugs even harder: e-cigarettes or vape pens. It used to be that if you would try to get high, it would smell. But Tianga says, all that has changed. That same secrecy makes it tough for police to know what’s inside that vape pen. They have to get it tested by a lab. A recent CDC study found e-cigarette use more than tripled among middle and high schoolers in 2014. It’s not known how much of that is drug-related, but young vape users are posting videos of themselves getting high on YouTube. All of this is so new, no one’s keeping track. No one knows just how many people have been injured or have died from vaping synthetic drugs. But already emergency rooms are seeing an increase, and the stories are disturbing. Doctor Cunha says recently, a patient was discharged after an overdose, and went into a hospital bathroom on his way out of the hospital. There, he vaped more drugs, and had to be taken back to the ER. The thing to remember is that these are not classified as drug paraphernalia, so there’s no federal age limit on who can buy them, although many states have restrictions. And these shops are popping up everywhere, not to mention they can easily be bought on the internet. Now, the industry says that vaping is a good thing for a lot of people; that it’s helping people to quit smoking, not start smoking. They say everything is subject to abuse by drug addicts. Of course, there is a study that show that many of the teens that vape never smoked before. Minors in New South Wales will not be able to buy electronic cigarettes following new anti-e-cigarette laws that came into effect recently. The sale of electronic cigarettes has been banned in the southeastern Australian state. As per NSW Health Minister Jillian Skinner, the legislation was one of the priorities for the government. According to her, “Following our re-election in March, we moved immediately to ban the sale of e-cigarettes and e-cigarette accessories to minors”. E-cigarettes are increasingly becoming big business, even following decades of smoking laws and anti-tobacco messages. It has been revealed by data from the Centre of Disease Control that in the US, two million students have used e-cigarettes. According to Simon Chapman, a professor of public health at the University of Sydney, “In the US now, there are more kids who are vaping than who are smoking”. In the meantime, the American Heart Association’s Policy said that unrestricted e-cigarette use could lead to erosion of gains in smoke free laws and smoking cessation. On the other hand, some scientists support the use of e-cigarettes, saying they could be helpful in weaning people off tobacco. A battery is used in e-cigarettes so as to heat up a liquid, generally propylene glycol or glycerol. Usually, the liquid consists of nicotine. The concoction changes into an aerosol after it is heated and the aerosol is inhaled. And the user gets the nicotine buzz of a cigarette without the need of burning tobacco. A number of e-cigarettes are also available with a choice of different flavors like strawberry, apple and bubblegum. The 22nd Century Group said yesterday that it believed its cigarettes would become the first combustible cigarettes authorized by the US Food and Drug Administration to be marketed as reduced exposure products. President and CEO, Henry Sicignano III, said his company would submit its application to the FDA this fall and looked forward to receiving FDA authorization “to properly label and market our extraordinary Very Low Nicotine cigarettes in the United States”. He described the company’s cigarettes as being “protected by a very large number of patents and supported by a host of independent clinical studies”. In a note issued through BusinessWire, the group said that to date no big tobacco companies had been authorized to market their cigarettes as reduced exposure or modified risk tobacco products. Meanwhile, the group said yesterday that it had launched a new website for its ‘0.0 mg nicotine’ MAGIC 0 brand cigarettes. Launched in Europe in April, MAGIC 0 cigarettes are said to be made with the ‘world’s lowest nicotine tobacco’ but to have ‘the natural tobacco taste of conventional cigarettes’. ‘Without any artificial extraction or chemical processes, MAGIC 0 yields only 0.04 mg of nicotine per cigarette − 95 percent less nicotine than conventional cigarettes,’ the company said in its press note. ‘No other company can grow tobacco with such low nicotine content. Visitors to the new MAGIC website are provided with ‘details on the science that makes the world’s lowest nicotine cigarettes possible’. The website showcases also five independent clinical trials that have used cigarettes made with 22nd Century’s proprietary Very Low Nicotine tobacco. The website, at www.magiccigarettes.com, is available in eight languages: Chinese, Dutch, English, French, German, Italian, Japanese and Spanish.